How did I find myself in Cleveland again (in January, no less) for the 3rd time? for their late night happy hour menu. It was 10:30pm and we were able to grab two stools at the bar. Unfortunately, the seats were close to the door, so we had a frigid wind blow through every time it opened. The late-night menu had 5 items, all for $5. We opted for the Cuban sandwich (which was actually $6), fried Brussels sprouts, and the charred eggplant dip. 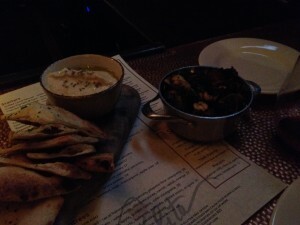 The guy sitting on my left raved about how outstanding the eggplant dip was - the best he's ever had. 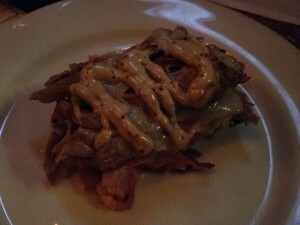 The Cuban was served open faced. It was delicious - easily the highlight of our meal. The Brussels sprouts were far too oily, and the charred eggplant dip was good but no better than the excellent baba ghanouj I get at Sevan in Watertown. The accompanying homemade flatbread was terrific. The drinks specials were also cheap: $5 for two different cocktails and $4 for wines, $3 for beer. We had fun talking to our neighbors, and the bartender was sweet and tolerant as we got louder and rowdier as the night went on. 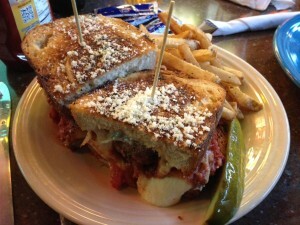 Since I don’t re-blog I won't go in to detail about my lunch at Melt, except to show you the pictures of the sandwich I had. 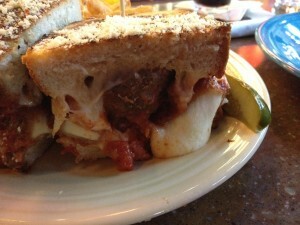 “The Dude Abides” is a grilled cheese sandwich stuffed with homemade meatballs, fried mozzarella wedges, basil marinara, roasted garlic, provolone & romano. It was awesome.